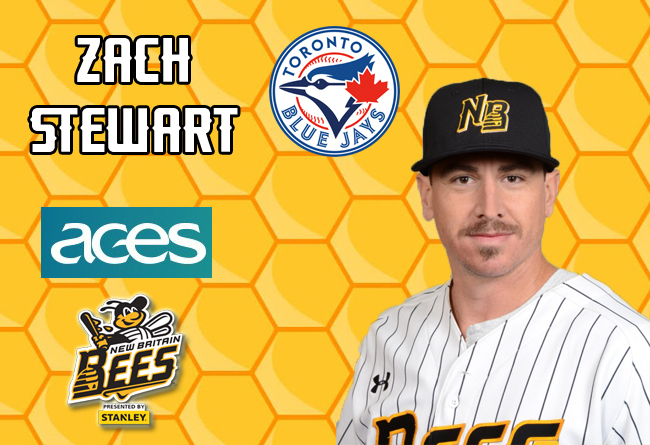 (New Britain, Conn., July 5, 2018) - New Britain Bees team officials have announced that pitcher Zach Stewart has had his contract purchased by the Toronto Blue Jays organization. He will report to Triple-A Buffalo of the International League. This season for the Bees, Zach make 11 starts, posting a 6-3 record with a 3.42 ERA and 42 strikeouts in 68.1 innings pitched. The 31-year-old was originally drafted by the Cincinnati Reds in the third round of the 2008 MLB amateur draft. The following year, he was traded to the Toronto Blue Jays as part of a deal for Scott Rolen. The righthander would spend a couple seasons in the Blue Jays organization before making his Major League debut with Toronto in 2011. He would also spend time in the big leagues with the Chicago White Sox and Boston Red Sox. Overall, he appeared in 33 Major League games (14 starts), recording three wins and 64 strikeouts in 101.0 innings of work, including a complete game shutout of the Minnesota Twins on September 5, 2011, where he only allowed one hit and struck out nine batters. Coming into this season, he held a record of 55-53 with a 3.73 ERA and 806 strikeouts over the course of 1,035.2 innings in 227 minor league appearances (169 starts). Stewart is the fourth Bees player to have his contract purchased during the 2018 season.